since 2010 and have sold them around the globe. ​from ear to ear upon opening your package for the first time. Our exquisite costumes are high-quality, made to last for years and are perfect for your event, play or gift for Birthdays, Christmas, Halloween or that very special train ride. Please feel free to browse around our store and contact us if you have any questions. 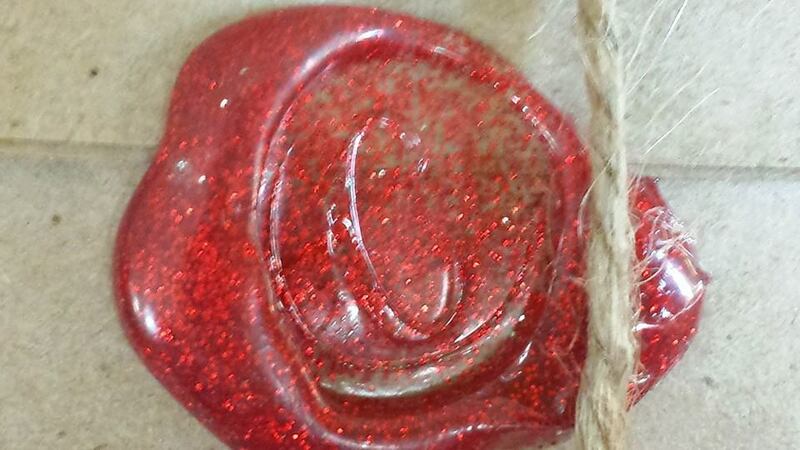 All shipping costs on this website are for USA shipping addresses only. 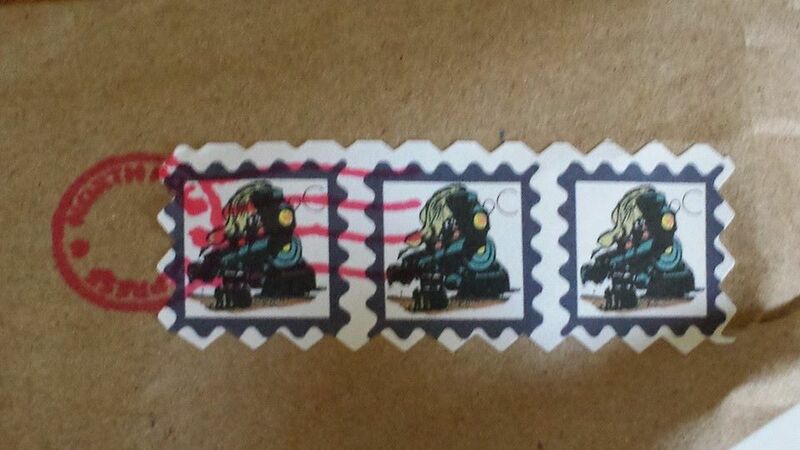 ​ so that we may provide you with an accurate shipping cost. customs and/or VAT fees upon delivery. IMPORTANT NOTE: These costumes have large and small buttons and the accessory sets contain real objects that could become a choking hazard when given to young children. Please use caution and supervision when giving to /wearing around any young child. Complete 5-Piece Black Suit with Jacket, Vest, Tie, ​Slacks & white shirt. (Suit and shirt is machine washable & dryer friendly). Please check your order and the size charts carefully prior to ordering. We do not honor refund or exchange requests for any costume items once your order has been received. pre-determined by the size of the jacket and will be shipped un-hemmed so you can alter the length as you wish. We cannot customize the sizes. ​up to 22". The Deluxe Adult Hat is available is three sizes ranging from 7 1/8 - 7 5/8). You simply add your own white long-sleeved shirt to complete the look. ​International orders need to contact us first for actual shipping costs and are responsible for any customs and VAT fees upon delivery. that could become a choking hazard when given to young children. and plenty of pockets to store tickets and punchers. and save $20 off the al a carte price. ​Upgrade is only available if you are purchasing an Accessory Set, Vest & Tie Set or Accessory Set from either the Polar or Black Classic collection. ​Please check your order and the size charts carefully prior to ordering. We do not honor refund or exchange requests for any costume items once your order has been received. 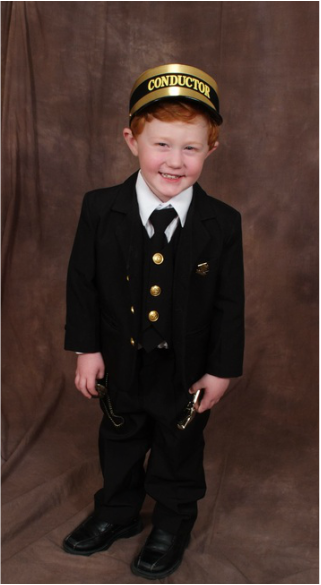 The beloved Polar Express Conductor jumps right out of the story book and comes to life when your child wears this beautiful, high-quality costume. This REAL suit features real pockets, is machine wash and dry and will most likely last until your child outgrows the costume. A gorgeous, complete 5-Piece Navy Blue Suit with lined Jacket, Vest, Tie, Slacks & White shirt. (Suit and shirt are machine washable & dryer friendly). including a sharp pin back that could become a choking hazard when given to young children. pre-determined by the size of the jacket and will be shipped un-hemmed so you can alter the length as you wish. We cannot customize the sizes. This suit instantly transforms any adult into the magical Conductor that we all fell in love with. ​with that hot chocolate! You simply add your own white long shirt to complete the look. 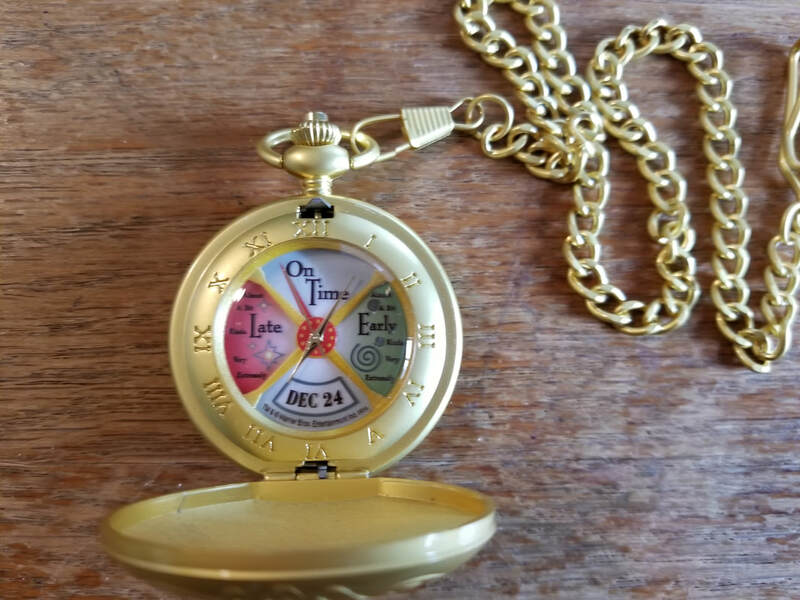 Polar Express Pocket Watch Upgrade Offer! 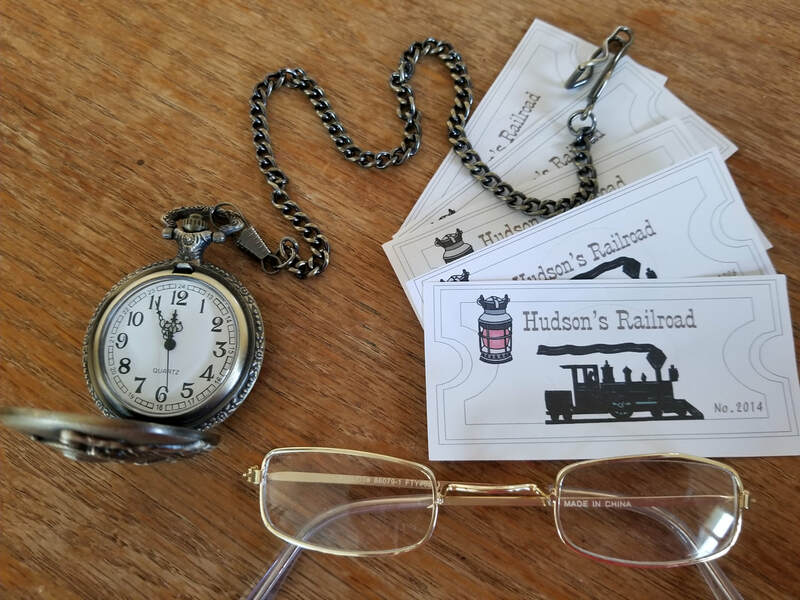 If you would like to upgrade your Classic Pocket Watch to the Polar Express Pocket Watch, simply add on the upgrade option below and save $20.00 off the al a carte price! 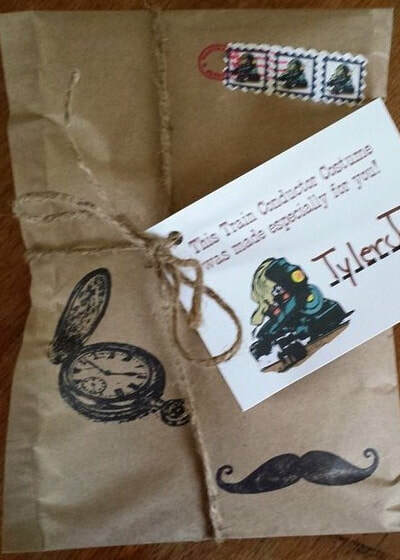 Upgrade your order to include the Polar Express Pocket watch! IMPORTANT NOTE: These costumes have large and small buttons and the accessory sets contain real & sharp objects that could become a choking hazard when given to young children. Please use caution and supervision when giving to /wearing around any young child. "On Time", "Early" or "Late." This is a special purchase and are ordering a limited quantity of these incredible watches. The watches are battery operated, (included), with quartz movement for accuracy and are gold plated. 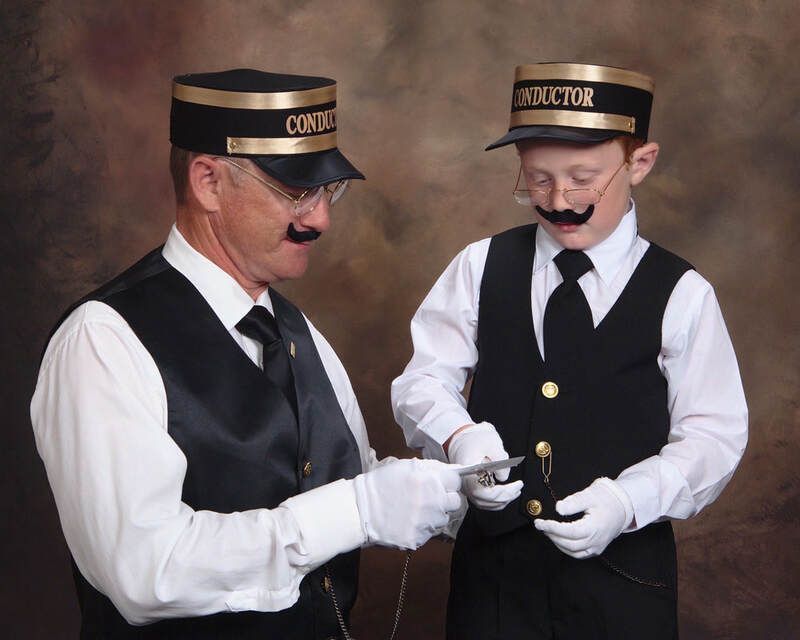 NOTE: The upgrade discount is only available if you are purchasing an Accessory Set, Vest & Tie Set or Full Costume from either the Black Classic or Polar Express look alike collection. Show everyone that you "BELIEVE" in the *MAGIC* of Christmas all year 'round with our beautiful BELIEVE ticket lapel pin. It may be tiny in size, measuring 7/8" x 3/8", but it's message is powerful! ​and as an "Extra pin" with purchase option. International orders need to contact us first for actual shipping costs and are responsible for any customs and VAT fees upon delivery. IMPORTANT NOTE: SHARP PIN ON BACK! Please use caution and supervision when giving to /wearing around any young child. 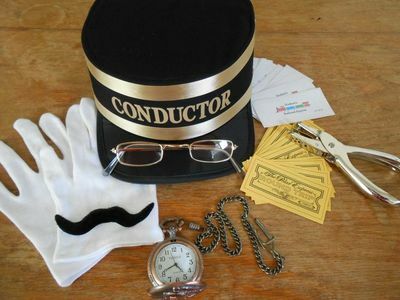 Make your Train Conductor Costume gift even more special by including a *magical* gift letter from Santa Claus! Each letter is printed on Santa's official cream stationery, hand-signed and then stamped with Santa's gold seal. This very special letter features a North Pole folder with a pocket containing a BELIEVE ticket tucked inside. 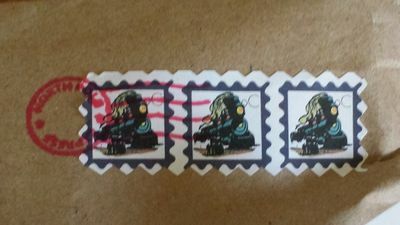 The folder is sealed with Santa's gold "S" in wax and scarlet ribbon, postmarked by the North Pole Express and addressed to the recipient. 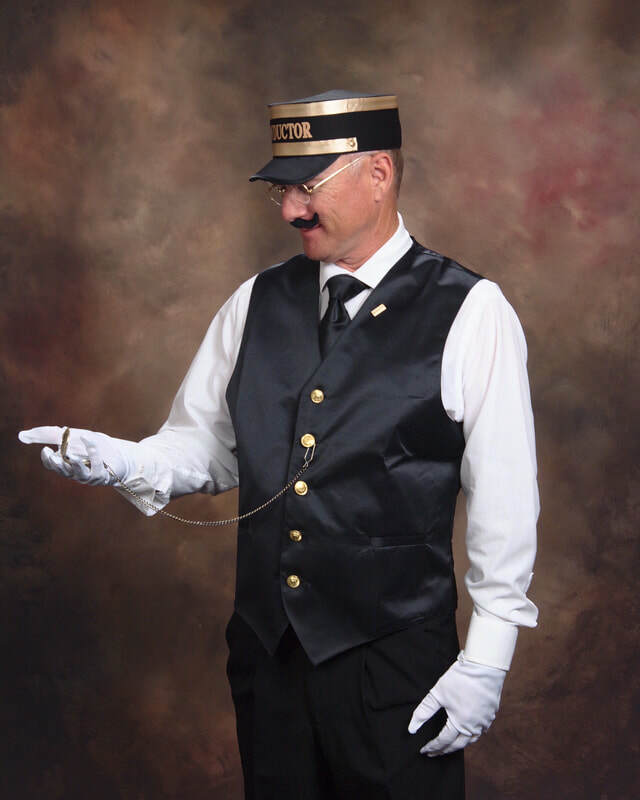 Every Train Conductor needs a pocket watch to keep those trains running on time. Our real pocket watch is embossed with a gorgeous locomotive on the front and features a long fob chain to hook on the button hole of your vest or jacket. Make your gift extra special by including our exclusive hand-crafted, old fashioned "Telegram" personalized with your own message and a special date. 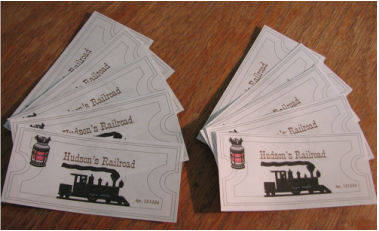 These personalized tickets are included with every costume and accessory set. Don't have a printer at home? Don't want to bother with printing and cutting the personalized tickets yourself? This option allows you to purchase as many extra tickets as you would like - all pre-cut and ready for punching! (We'll print a first name or company/event name you wish as long as we can fit it on the first line). 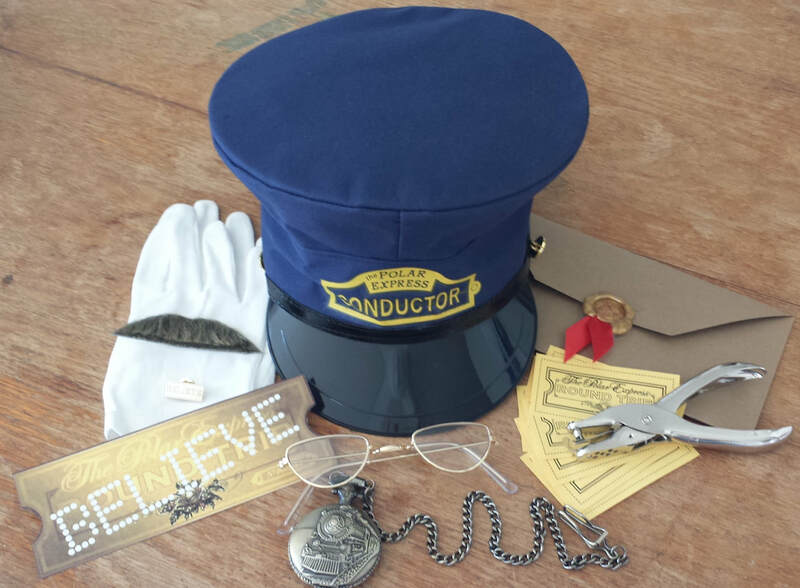 These Gold Polar Express mini tickets are included with every Polar Express costume and accessory set. Don't have a printer at home? Don't want to bother with printing and cutting the personalized tickets yourself? This option allows you to purchase as many extra tickets as you would like - all pre-cut and ready for punching! 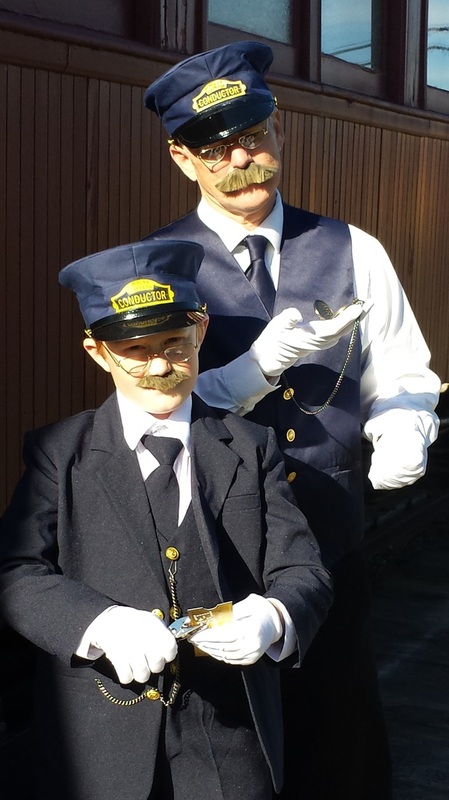 $59.99 Upgrade the Classic Watch to the Polar Express Watch on any costume or accessory order. The "First Gift of Christmas" is captured in this beautiful silver bell. This magical gift features the words "The Polar Express" engraved along the rim, includes a very special note from "Mr. C" and the classic red & white striped gift box. This is a special purchase only a limited supply ​will be available for purchase. Once your payment has been received, your order will be ready for shipment in approximately 7 business days.﻿ ﻿If you need the suit sooner, please contact us first so we can give you a more clarified delivery date. Your package will be wrapped in paper & shipped in a box via US Priority Mail. International Orders: We ship worldwide. Please email us with your desired order & shipping address so we may provide you with an accurate shipping cost. Please note that you will be responsible for any customs and/or VAT fees upon delivery. Refund/Exchange Policy: These are costumes - not uniforms. We do not accept returns, exchanges or issue refunds. All sales are considered final. Please choose your size carefully using the size chart before ordering.